Designears are the world's first ever fully-customizable headphones available exclusively from OrigAudio. Designears feature noise reduction technology and the opportunity to showcase the customers personal style. Designears headphones give consumers the opportunity to design and create a look catered exclusively to their style with the sound quality they crave. OrigAudio, maker of award-winning portable speakers, today unveiled their latest innovation: Designears, the world’s first fully customizable headphones. Offering full-stereo sound with noise reduction technology, Designears headphones give consumers the opportunity to design and create a look catered exclusively to their style with the sound quality they crave. They have a unique personality, and now their music does too! 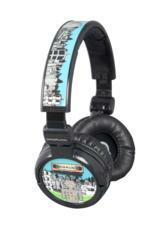 Each set of headphones invites personalized design across both earpieces and headpiece, featuring full digital color printing on a plastic color of the consumer's choice. The style of the Designears is limited only by the consumer's imagination; select personal artwork, photos, graphics, and logos or choose from premade designs and patterns. Designears offer the newest form of personal expression as well as the perfect gift to friends, family, co-workers, and more. In addition to endless customization options, Designears feature soft cushioned earcups and convenient volume control for hours of listening comfort. A single headphone cord eliminates tangles while an accompanying hard case protects the headphones in travel and storage. Designears are compatible with any standard headphone jack, meaning anyone can listen to music and audio from their favorite devices including laptops, tablets, mp3 players and smartphones. Designears are available now at the OrigAudio online store (http://www.origaudio.com) at the suggested retail price of $69.99. For more information and images please email sara@fortyfourgroup.com and follow @Origaudio on Twitter.